GBP/USD has shown a nice jump of more than 200 pips from 7- month low of 1.3100 made previous week. GBP was trading slightly higher against all majors on account of hawkish BOE comment. BOE has kept its interest rates unchanged but hawkish surprise came from MPC vote count which raised odds of Aug rate hike. The declining US boind yields and renewed trade war tensions has prompted fresh selling in USD. But Brexit uncertanities is expected to cap further gains in GBPUSD. It is currently trading around 1.3290. Technically the pair has jumped slightly above 1.3300. The pair should close well above 1.3310 (20- day MA) on dalily basis for further jump till 1.3470/1.350. 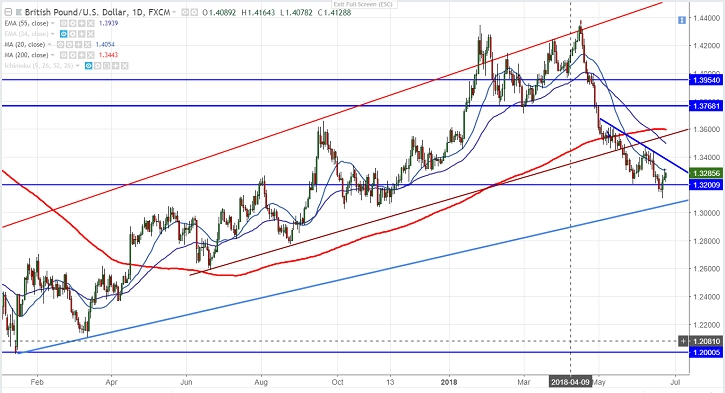 On the lower side, near term major support is around 1.3200 and any break below will 1.3100/1.3045 (trend line support)/1.3000. It is good to buy on dips around 1.3255-60 with SL around 1.3200 for the TP of 1.3470.